Sure, sometimes I get frustrated by towels heaped on the floor and shoes strewn across the kitchen and living room. I sigh over coats stripped off and dropped on the linoleum. I whine over piles of paper and toys dragged from one room to another and then abandoned. I make speeches about obedience, right away, the first time I say it. But there are days when your mom heart is shocked into tears and all the petty annoyances fade and the selfish bits of your heart are tamed back into unselfishness. It’s when you hear of a school shooting and so many little ones dead. It’s waking up on a normal, totally average morning and slowly going about your normal, totally average routine, and then reading the news: three young children—babies really—and their grandmother dying in a house fire just 5 minutes from my home. Suddenly average doesn’t seem so average anymore. Every moment seems specially blessed. I was thinking and praying all week about the verse to share this morning. 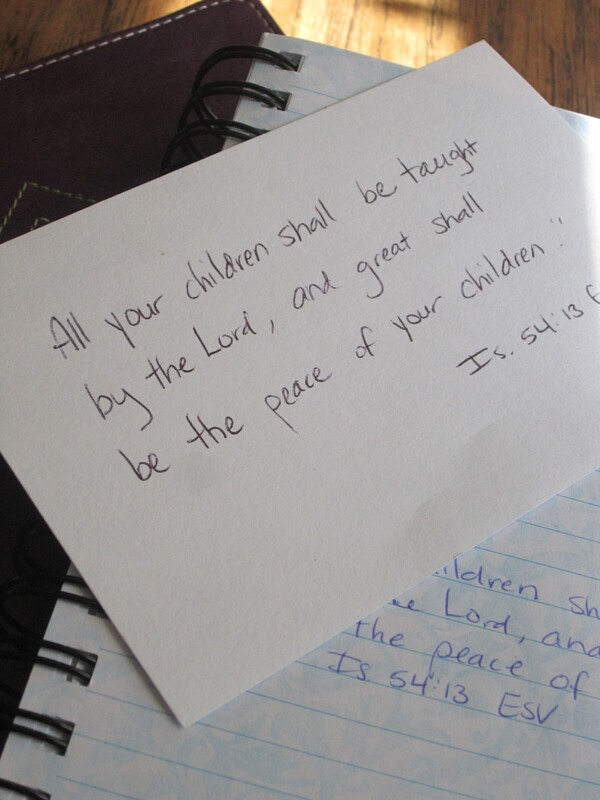 In my scripture memory project through Beth Moore’s SSMT, I needed to choose verse #2 of my 24 verses for the year. I read through all of the beautiful verses other women had chosen. I went through my prayer journal for the week and thought first this one and then that one. And I prayed. Of course, I prayed. But when it came down to what was on my heart and mind, the verse that Beth Moore herself chose reflected what I was praying. How could I not? So soon after national tragedy and so soon after a tragedy in my very own community, my heart is heavy for my children. We aren’t promised their safety or their salvation or their health. Yet, we are given this great joy, this weighty responsibility, this amazing calling to love them, train them, guide them, and more than all that, to pray for them. Yes, teach these children Your own wisdom and the joy of Your presence, Lord. Help them to know You personally and be real, present and active in their lives. In the very moments of their need, reveal Yourself to them and be their ever-present help in times of trouble. Bring peace into their lives, into their hearts and minds, into their relationships. We place them in Your hands and trust them to Your care. Please help us to know when to speak and when to listen, what to say and how to love. We are imperfect and weak; forgive us when we mess all this up, give us grace for a new day, and guide our steps, actions and words. In Jesus’ name, Amen. I just loved the verse she chose this time, Lauren! This is perfect for me today. It was an answer to a prayer. I really needed to be refocused. Thank you. “Refocused.” Yes, I think that’s exactly the right word for what I needed and I think it’s good to have that refocusing every so often. It’s too easy to forget.